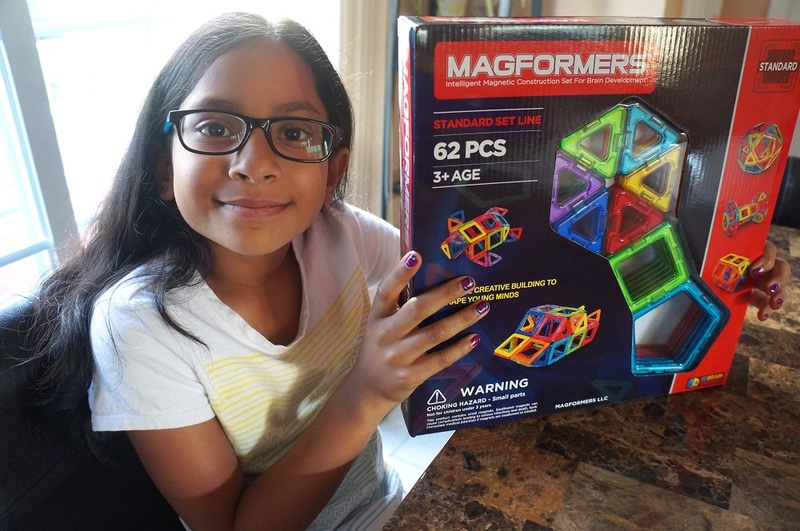 Keep your kids busy with this MAGFORMERS Magnetic Construction Set. It has been a challenge to keep my little one busy with activities this past summer. She is home with me all day and it seems like whatever I do is not enough to keep her from being bored. I am sure I am not alone and have moms in the same boat as me. In addition to that I found myself constantly forbidding her from using my phone, my laptop or watching TV. Keeping her busy ended up being a lot more work for me. So when I received the Magformers Magnetic Construction Set for review purpose, it was blessing in disguise. Since receiving this set, my little one has kept her self busy and out of my hair. Not only is she having a blast constructing different models, I can see she is truly enjoying it. 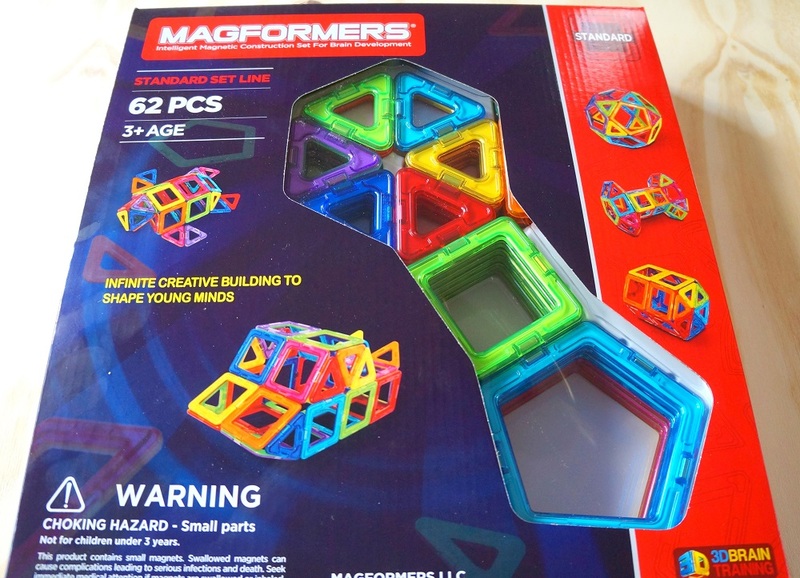 For those who are not aware of Magformers, it is a magnetic construction set which includes easy to use magnets housed in high quality, multi-colored ABS plastic. They come in different shapes and sizes. These pieces are designed to attract, which in turn helps them to connect to each other. The genius thing about these pieces are that if they are not connected correctly, they repel. 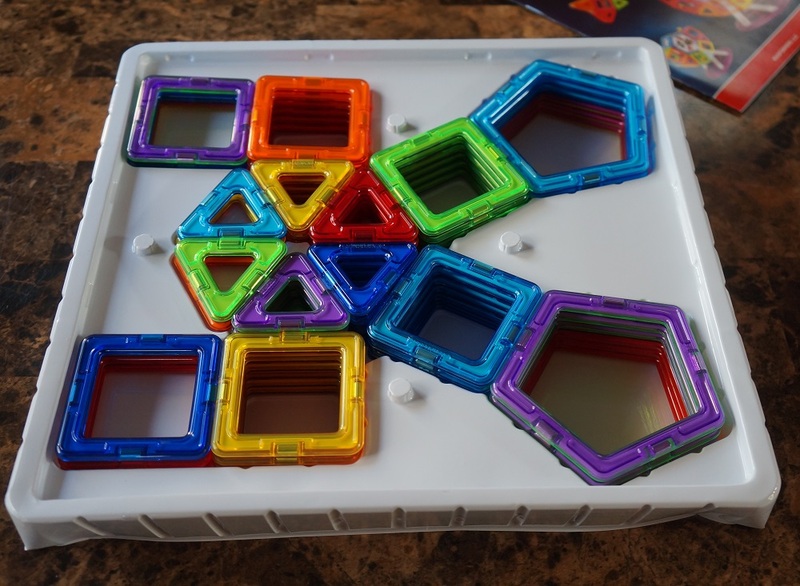 This offers additional challenge to kids who then have to figure out how to connect them properly. We were provided with the 62 pcs construction set. This set was recommended for ages 3 years and above. The set includes 20 triangles, 30 squares and 12 pentagons in different colors. It also included a model booklet with instructions. Once we opened it, my little one immediately set out to build the models she was interested in. Since this was her first time, I asked her to check out the model booklet for an easy project. 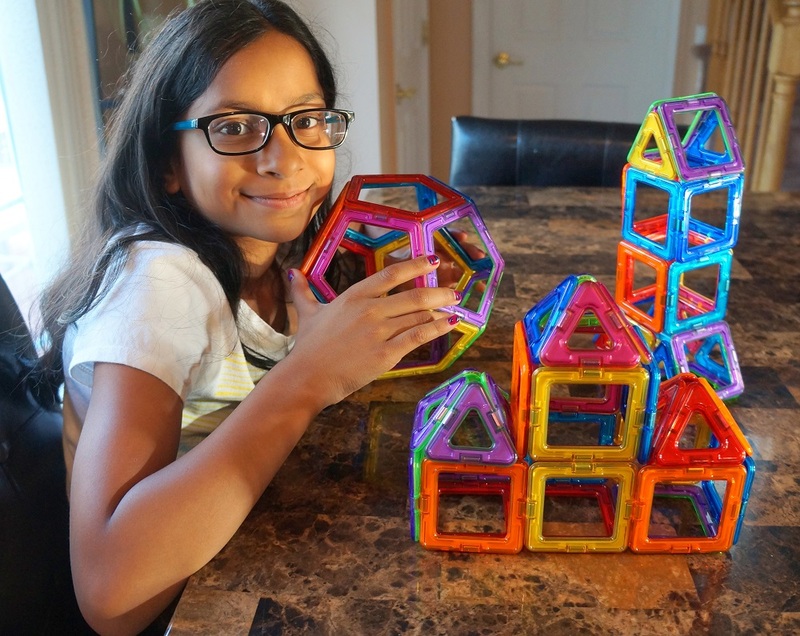 She chose to make a Dodecahedron. At this point I would like to mention that model booklet had easy to understand pictures and instructions. You cannot believe how easy it was for her to assemble her first model. Connecting the pieces together was a breeze. Next she set out to construct a rocket, followed by a castle. Both were simple, but detailed and she accomplished them with ease. She loved that she was able to construct as well as de-construct the models so easily. Unlike other toys/sets this one was not difficult to dissemble. After proudly displaying all of her creations, she dissembled all the pieces and set out to make other models. Trust me when I say, she is now actually obsessed with the Magformers Magnetic Construction Set and as a mom this is great news to me. Like MAGFORMERS on Facebook and follow them on Twitter for all of their latest updates. We do have some more good news! 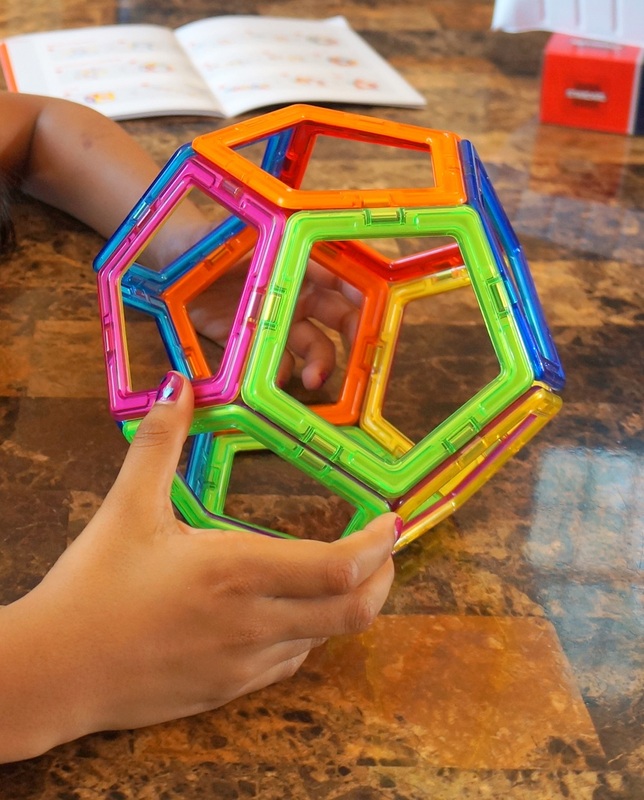 We will be giving away this exact same MAGFORMERS Magnetic Construction Set within the next few weeks. 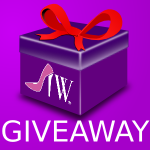 So make sure you check back and enter. This will make a great gift for the holidays! The reviewer received this product in exchange for an honest review. All opinions are honest and her own. 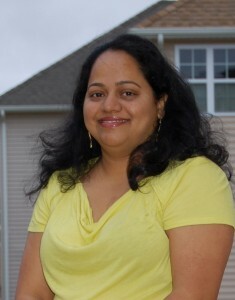 Babita Shringare is a mother of two, NJ based Indian-American Blogger who blogs at BabsProjects. On her blog she likes to write and feature DIY and craft projects, unusual and fun fashions, and traditional Indian recipes. This really does sound like an educational toy (I believe it could actually be used for educational purposes as well as just fun) that I would love to gift. My niece is a bit too young yet–but in about a year she just might be receiving this. Keep ing kids entertained is a fulltime job. When I was young, I was outside getting dirty with my friends all summer. With my kids, I would let them on the computer to find a project. They had half an hour to search for something creative to do, print it out, and then we would gather materials and they would do it. Just a suggestion for future bored summer days. I have had my eyes on Magformers for the past year or so! I was not sure if it’s a good fit for girls or if just boys would enjoy them. I guess I know now. I will have to get a set for our daughter this year for Christmas. I love all the inspiration the catalog starts you out with. These are so fun, and there’s something satisfying about magnetism! What a fun set for kids!!! I love when toys make kids think and be creative when playing. My son plays with these or something like these (I hope these) at preschool and he loves them so much. I love the creativity and imagination involved. I never know what to buy for our Grandkids when it comes to toys. This looks like something our Grandson would really enjoy. He loves to build. A couple of days ago, he was trying to build a Halloween decoration for his Mom. WOW this sounds like the perfect thing to get my friends little boy. He would love it! I think I would too honestly! I love how this gets kids to use their imaginations. It will make a great Christmas gift. I want one for myself. Very cool. I like that your daughter is building adn crating. Not many toy companies promote to girls when it comes to building. Great time filler. 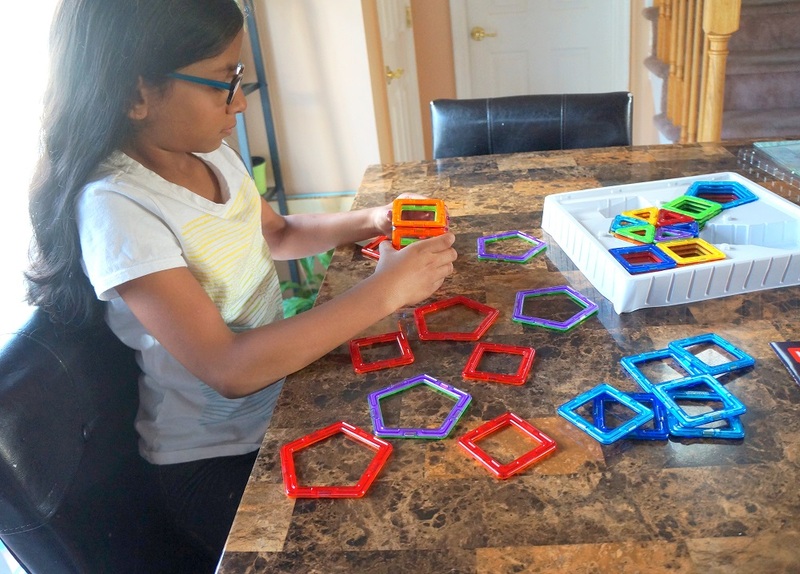 It’s not only fun but is also educational and can encourage imagination after she has created all the diagrams in the book, she’s now free to create her own. My kids would love to build with this! It looks like so much fun! What a great set of building blocks. I think these are great because they are dimensional – not at all like the building blocks I had when I was young. That looks like a fantastic set. My kids loved building when they were little, and I would have bought this for them in a second. My grandaughter would love these she loves building. Very nice toy, I love toys that incentivate creativity and mental work. This toy is a much on our Christmas list. Fantastic option for kid entertainment. I have an almost 8 year old and 10 year old that would love a toy like this. I could see this as a perfect gift for the holidays! That looks fun, I bet my kiddos would LOve this, Thanks for sharing!!! I really like that this construction set is magnetic. That means that it is easier to create structures with it and that it won’t be as easy to lose the pieces. I always prefer toys that could help learn something for my kids and make sure they are involved with a clear focus on it. 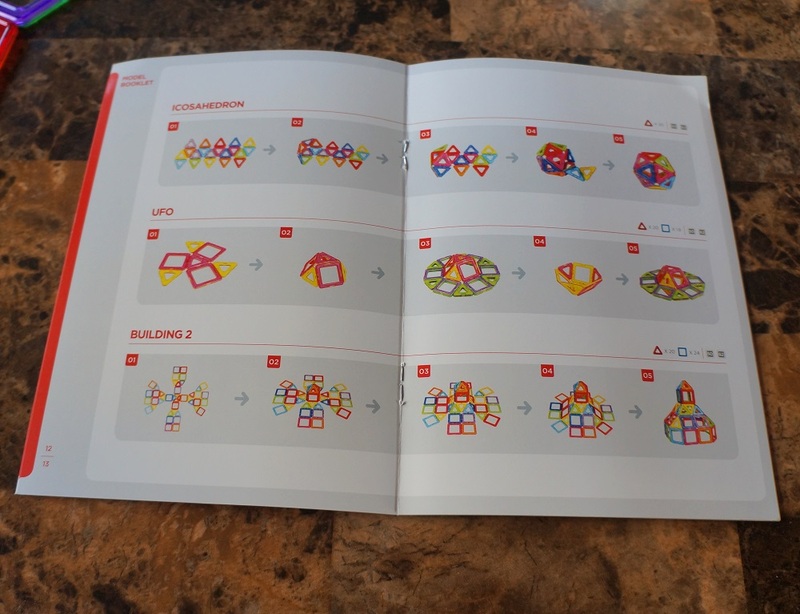 The Magformers Magnetic Construction Set looks amazing and I would love to get one for my kids as well. Kids would love this especially on bad weather days or even trips to keep them from getting bored! I’d love to get this for my daughter. Thanks for posting! My kid wants that so bad but I’ve told him that he has to wait for Christmas. These look like so much fun! My grandchildren would have a ball. My son, age 9, loves these Magformers. He spends hours with them. They are a wonderful toy for children.